I started investing with Lending Club in August of 2010. Two years later, I’ve seen an awesome 13% rate of return on my initial investment. 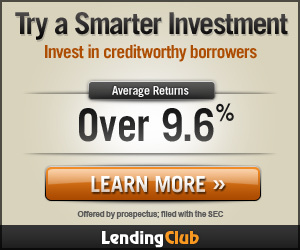 Lending Club is a relatively new site that brokers peer to peer lending. In essence, you become a bank and you are free to browse and invest in thousands of notes at various interest rates. From a borrower’s point of view, Lending Club is a great option. As long as your credit score is above 660, you can apply for up to a $35,000 loan. The interest rate a borrower receives will depend mainly on their credit history. In fact, the rates are very competitive when compared to banks(ranging from 6.78% to 29.99%). The interest rate is fixed for the term of the loan, either 3 or 5 years and borrowers can apply for loans online with a relatively simple application process. Lending Club seems like a great option for borrowers, but what about for investors? There are several income restrictions listed on Lending Club’s website, but in general most people should qualify as long as you live within the following states: California, Colorado, Connecticut, Delaware, Florida, Georgia, Hawaii, Idaho, Illinois, Kentucky, Louisiana, Maine, Minnesota, Missouri, Mississippi, Montana, New Hampshire, Nevada, New York, Rhode Island, South Carolina, South Dakota, Utah, Virginia, Washington, Wisconsin, West Virginia, and Wyoming. In just a few minutes, you can be on your way to investing with Lending Club. I funded my account through a bank transfer and was immediately able to browse through hundreds of notes. Lending Club offers several automated options that select notes based on interest rate. However, I choose not to use this automated tool. I think it’s best to use a customized filter in order to narrow down your potential investments. Please explain the reason why you carry a large revolving credit balance. What is your intended use for the loan proceeds? What are your current debt balances, interest rates, and monthly payments by type (credit cards, student loans, mortgages, lines of credit, etc)? These filters really narrow down your eligible pool of investments, but I think they make a lot of sense. I’m looking for someone who’s had relatively stable work the past couple years and owning/paying a mortgage on a house makes me think they are less likely to default. I never invest in debt consolidation loans, so it’s important that the credit card utilization be low and there are no delinquincies in the last two years. The goal of these filters is to remove the emotion out of investing in peer to peer loans. I don’t even bother looking at the pre-defined questions because there is no way to verify the answers. The most important part of this strategy is to select the higher interest loans. I don’t think the lower interest rate loans justify the risk. The aforementioned criteria should help you negate some of the risk and although my sample size is somewhat small, you can see my results have been overwhelmingly positive. Before you go invest your hard earned money in Lending Club, it’s important to know the risk. As with any investment, the higher the rate of return, the more risk there will be. I’m still skeptical myself of investing a large amount(ie $10,000) due to the infantile nature of peer to peer lending. Remember that these loans are unsecured, meaning that if the borrower defaults, your money is probably lost. Lending Club will attempt to retrieve the principal, but there is no guarantee you will ever see that money again. That’s why it’s important to diversify across many loans. Lending Club initially charged .5% service fee but that has increased to 1% over the years. All peer to peer lending companies are not FDIC insured, so in a worst case scenario, you could be out some or all of your investment in the event of bankruptcy. Though to be fair, Lending Club has seen strong growth in the past few years and I think the benefits definitely outweigh the risks. My last issue with Lending Club has to do with taxes. Unless you make over $15 on a single note, you will not receive a 1099 from Lending Club. Your income will not be reported to the IRS so it’s up to you to report the income from all of your notes over the course of the year. Lending Club investments are not considered passive investments either, so you cannot lock in the long term capital gains tax rate. For this reason, I am considering funding a no fee Roth IRA with them this year. 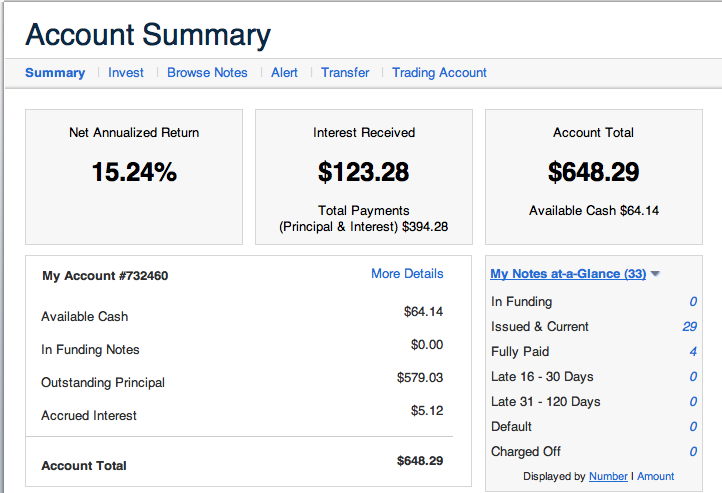 I started investing with Lending Club almost 2 years ago, and I’m very happy with the results I’ve achieved so far. I don’t think I would commit more than $5,000 to peer to peer investments, but it looks great when compared to the current CD and bond markets. Remember there are some inherent risks with peer to peer lending and we probably won’t know the ins and outs of this particular investment type for many years to come. Any time you can achieve rates of return like this you’re taking on high risk. So if you’re a borrower and Lending Club offers you a lower rate than a bank, it’s a no brainer. But for investors, be careful and do your due diligence and research before investing with Lending Club. Would you consider investing in a peer to peer lending site like Lending Club or is it too risky for you? your zero defaults is UNHEARD of, Rare at best and impossible to replicate. Yea I’ll be the first to admit I may have gotten a bit lucky there. But I do think there is some value to the filters, I’ve set. I think they are simple, but make a lot of sense. Thanks for sharing your filtering criteria. One filter you may want to include moving forward is capping the number of inquiries in last six months to 2. Punching your filters into LendStats.com, loans matching these filters have performed with an 8.41% ROI since 2010. Adding the max number inquiries of 2, that number improves a full percentage point to 9.4% ROI. Wow, thanks for sharing that awesome site! I’ll have to take a look at it in further detail. I have actually been trying to think of ways to broaden my criteria since so few loans actually pass my filters. I’m thinking of investing my 5k Roth IRA this year in LC but I don’t want to spend too much time constnatly checking for new loans. I have 16.2% return on mine. I think steady income, controlled expenses (living within your means), and years of employments are factors I consider. Thanks for the comment Sun. 16.2% is an awesome return! Hopefully you’ve got a lot of money invested.. I also think you have been fortunate; Expect to get less or no loans to invest with your filters. You may look good now, but your loans have to last 3-6 years. So embrace for more defaults. Usually LC does not recommend accounts that low as many defaults may wipe up your interest quickly. Filters are tricky, f.e. going for homeowners with ownership or mortgage filters out almost all from C to G. I used to have that filter, thinking there will be a payback by a responsible individual. However, I have seen live at home students applying for a loan, writing ‘own’ as in ‘owned by their parents’. One of my first defaults was an ‘A’ lister, and I learnt, that a house will not qualify as collateral for your LC loan. The only thing with home ownership is that you may sense a more responsible individual here, familiar with regular payments, but as I said, beware of students or dependents. Watch closely, some loans to ‘renovate’ may just be a desperate attempt to spruce up a house that is not worth a mortgage by someone who is terribly in debt. After many defaults, I learnt, ‘A’ listers are either defaulting crooks or not worth investing in because of low return. I always wonder, why LC gives an ‘A’ rating even to some that show defaults in the past. When an ‘A’ lister stops paying, he almost always defaults. Lower Grades, such as C usually are going for a payment plan where you will get some of your money back. A better filter is common sense and lots of prejudice (sorry). I usually stay on the safer side and still have more defaults than the calculation expects. One of my filters is to judge the income to loan size ratio yourself. Imagine if it is really possible to make a modest living with that income after paying back that loan amount. If the loan is more than triple the income, stay cautious and look at the debt to income ratio. Why are there suddenly so little qualifying loans available? I agree with you that filters are a little tricky, it’s the causation vs correlation argument. While owning a home may be correlated to less defaults, it doesn’t mean that that’s the cause. If the economy goes in the tank again, all those homeowners could default very easily on all my loans. I’m not too worried though since I’m investing only $700+ in my after tax account and $10k in my Roth IRA which is less than 5% of my portfolio(my personal rule of thumb is to never invest more than 5% in untested/alternative investments). I think it’s tough to really analyze what means what in terms of home owners being more likely to pay back, etc. Instead, I prefer the trial and error approach, this set of filters was my trial(so far, so good) and now I’m going to apply it to 5k worth of investments in my Roth IRA. Although I can’t guarantee it will work, I am feeling confident enough to invest 5k. That might not be a lot in overall terms but 5k is still a lot of money to anyone! I actually found a few loans that matched my tier 1 filter the other day when I checked at 2 pm so I’m going to try and check at those times for a few weeks and see how quickly I can invest my 5k. At 9:59 am today, there were 87 loans available, went up to 179 at 10:01 am and there were 2 notes that matched my tier 1 filter. Thanks for your article, very informative; i got into lending club recently as an investor and created a portfolio myself with 60% A, 25% B and the rest comprised of C grade and below. No problem knox, thanks for commenting. You should get a lot more of a return than with a checking account, but obviously there is more risk. I think it’s more of an uncertainty risk though since p2p lending is such a new form of investing. You have to be a little careful filtering based on descriptions since the borrowers could very easily be lying in this section, I wouldn’t put too much into the description of the loan.